Vegetarian spring rolls- pin now, make later! How to make spring rolls- Pin it! Our go-to restaurant in our town in Germany is, oddly, a Vietnamese restaurant. They serve fresh, delicious food, and I always choose their spring rolls as an appetizer. When I stumbled upon Vietnamese rice wrappers in the store the other day I was psyched to try to recreate the restaurant's version. The end result was exactly what I love about spring rolls- healthy, light, and satisfying without being filling. I ate mine plain, and my husband dipped his in fish sauce. Hope you enjoy! Lightly sauté your veggies and tofu. When they're ready, begin assembling. For the rice paper: soak them in warm water, individually, for two to four seconds. They'll still be a bit stiff when you remove them from the water, but don't worry, they'll soften as the water soaks in. Then transfer to a plate and layer your romaine, mint, tofu and veggies. Roll tightly from the bottom, and tuck the ends. 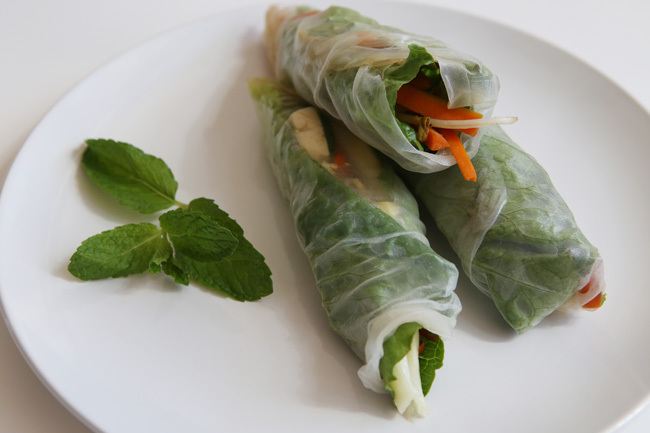 The quicker you start rolling, the better, as the rice paper tends to harden and get sticky quickly.